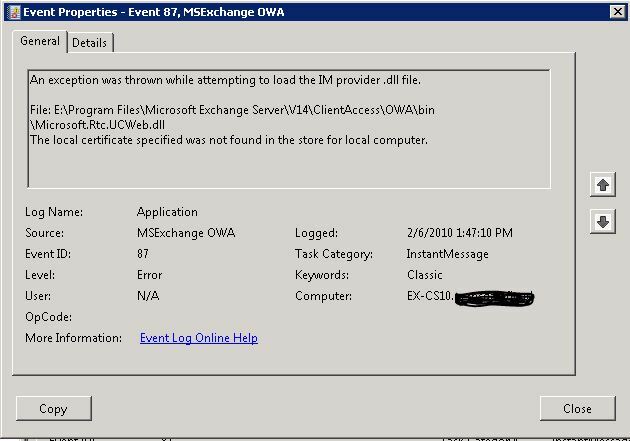 Recently while installing Exchange 2010 in a customer environment I ran into an error related to certificates when I tried to enable the OCS integration in OWA. The client had chosen Godaddy as their public CA of choice and as it turns out this played a role in causing the issue. Godaddy used a ” symbol in the issuer field of the certificate. Although it wouldn’t normally matter, it does when you are using that field in an XML config file, like the one used for IM integration with OWA/Exchange 2010. Now a little more reading and I see that people are having issues with using certificates provided by a different CA than the OCS certificates. Now I know OCS is picky sometimes, but I couldn’t believe it wouldn’t work because of that, and I had already added the public FQDN of the CAS server to my Host Authorization tab in OCS and it was working with the self signed certificate I used. Then it hit me-the public cert had a different subject name than the self signed certificate because the company had planned to update the web address in the coming months and we used SAN fields for the old address that was to be retired. I updated the Host Authorization tab with the subject name of the certificate (even though DNS didn’t point to it yet), iisreset on the Exchange 2010 CAS server and, voila, its working. 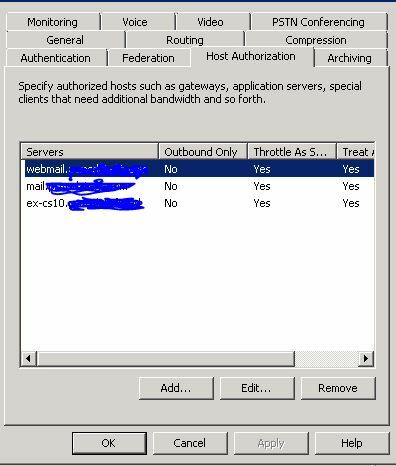 Just like Outlook Anywhere, the principal name from the certificate must be used in the Host Authorization tab. Now even when I’m in OWA, I have access to all of my OCS contacts and lists. This entry was posted in Uncategorized and tagged Communicator, Error 87, Exchange 2010 CAS, Exchange 2010 OWA IM, Godaddy, Godaddy certificates, Instant Messaging isn't available right now, OCS, OCS 2007 R2, The local certificate specified was not found in the store for the local computer. Bookmark the permalink. I basically have the exact same issue as you had. I am also using a GoDaddy Certificate, I sorted out the certificate issues last week, however, I keep getting the message “Instant Messaging isn’t available right now. In the Host authorization I have: I made sure I checked the correct permissions as well. I too am using a GoDaddy cert and am having the exact issue described.. However, I’m using a wildcard certificate.. My subject is *..com, which I wouldn’t be able to enter into the Host Authorization field..
What should I use for my subject to make this work? To make this work you have to have the subject name of the certificate in the host authorization field no matter what. For this scenario I would recommend getting a certificate with the webmails FQDN as the subject instead of the wild card. Hope this helps!